Maria P. became a Buffalo Jill because of her love for the Bills. She said she quit after the 2012-13 season because she was not being paid for all the hours she worked, but she was especially upset by the way the Jills were treated at some community events they were required to attend. “I could not go back because of the harassment and the way we were treated,” she said, citing degrading sexual comments and inappropriate touching at the Jills’ annual golf tournament. As a result, she and four other former Jills filed suit Tuesday in State Supreme Court in Buffalo against the Bills; Stejon Productions Corp., which currently manages the Jills; and Citadel Communications Co. (97 Rock), the Jills’ former manager. While the focus of the lawsuit is the defendants’ failure to pay them the minimum wage for all the hours they worked, the suit also cited their mistreatment at the Jills’ annual golf tournament, where select Jills were required to wear bikinis and go into a dunk tank where they were dunked by tournament participants. They were auctioned off like prizes and had to ride around in golf carts with the winning bidders, the suit says. “I signed up to be a cheerleader,” Maria P. said, “not whatever you want to call that. Cheerleading was my passion. I had no idea what would be taking place at these events. The suit notes that defensive end Mario Williams, the highest-paid player on the Bills, earns an average of $16 million a season under his contract, while the five former Jills were paid less than the minimum wage. They say that’s illegal, and they aim to change it with their lawsuit. The plaintiffs are identified in their legal papers by only their first name and the first initial of their last name, based on the Bills’ policy of protecting their privacy, health and safety. The suit alleges that the team exploited them by failing to pay them the mandatory minimum wage of $8 an hour for all the hours they worked each season, including their extensive work on game days and at 20 to 35 community events throughout the year, in violation of the state’s minimum-wage law. The lawsuit says that based on game performances, practices, rehearsals and appearances, each individual Jill provides approximately 20 hours of unpaid labor per week for the Bills and the Jills’ managers for much of the year, or about 840 hours of unpaid work per woman, per year. The five former Jills, who worked as long ago as the 2010-11 season and as recently as the 2013-14 season, were paid amounts ranging from as little as $105 to as much as $1,800 a year, according to the suit, which does not indicate what that compensation was for. But the compensation works out to considerably less than $8 an hour, the suit says. The Bills and the Jills’ managers also failed to reimburse them for certain business expenses, failed to pay them in a timely manner, took illegal deductions and kickbacks from their wages, unlawfully took gratuities paid to the Jills at some events, failed to adhere to the notice and record-keeping provisions of the Wage Theft Prevention Act and unjustly enriched themselves as a result of the Jills’ work, the legal papers say. The suit says that as a condition of employment, every Jill had to sign a contract classifying them as an “independent contractor,” not an employee. As employees, they would be covered by the state’s minimum-wage law and other protections. The suit says the contract is illegal because it violates the minimum-wage law and labor law. In addition to working hundreds of unpaid hours, Maria P. alleges, she and her fellow Jills were subject to a strict set of rules implemented by the Bills and Jills’ managers. “The team told us how to walk, talk, dress, speak and behave, both at work and on our own time,” she said. The lawsuit also alleges that the Jills were forced to endure degrading treatment as part of their mandatory participation in six annual events such as the Jills’ golf tournament and the swimsuit calendar release party at Turning Stone Casino near Syracuse, where they were required to wear bikinis and were subjected to degrading comments by some of those in attendance. The suit further alleges that the former cheerleaders were subjected to the “jiggle test” by the defendants to make sure their bodies were trim and that penalties were imposed for failing to pass the test and for other infractions of rules, such as posting a photo on Twitter. It also contends they were not compensated for out-of-pocket expenses such as their $650 uniforms, hairstylings, nails and travel to out-of-town events such as the calendar release party, the Bills training camp in Rochester and the team’s games in Toronto. The suit seeks full payment of the minimum wage for all hours worked, with interest; recovery of economic damages due to unlawful deductions and kickbacks; and recovery of gratuities. The legal action, filed by attorney Sean E. Cooney of the Buffalo law firm of Dolce Panepinto, comes on the heels of similar lawsuits filed by cheerleaders for the Oakland Raiders and Cincinnati Bengals against their respective teams. 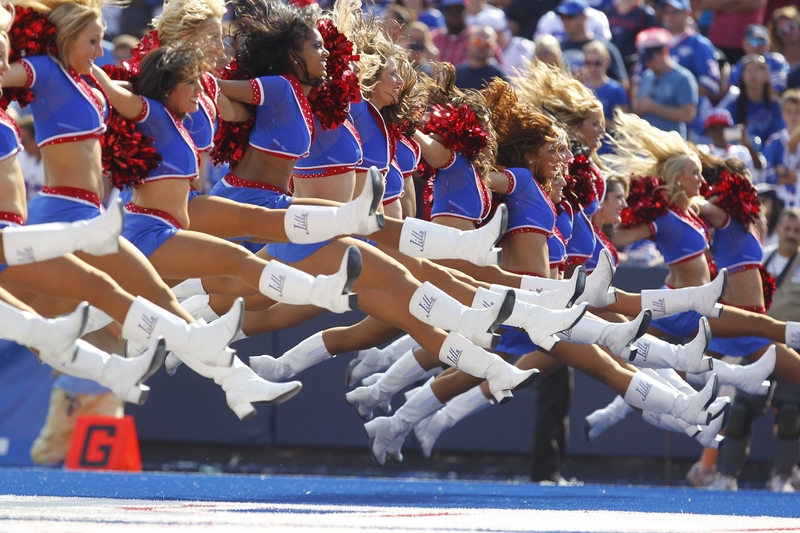 Cooney said he understands from current members of the Jills that the Bills and other NFL teams recently decided to pay their cheerleaders the minimum wage this season.